Myself and three friends rented Cliffehouse 15 for two nights in late March 2019, planning on a fun girl's trip to a winery. At $400/night + some hefty resort fees and taxes, it was pricey but sounded luxurious. 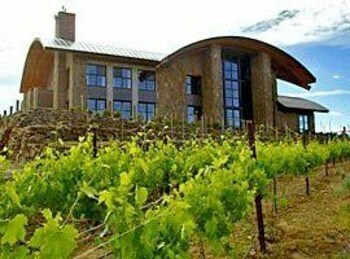 We pulled up to a rather rough and bare looking plot of vines with a few metal-roofed buildings on a hillside of gravel backfill, overlooking a scenic gorge. After handing us the keys, the girl at the front desk mentioned it was good I had a 4-wheel drive vehicle. We found out why when we drove around the property and saw a sign pointing down a muddy, rocky dirt road to our accommodations. There was no path into the room or stairs to the door; it looked pretty unfinished. We had to drag suitcases through a wet and muddy pathway to get into the room; the patio was strewn with decaying berries and some strange whitish splatter. The interior was alright: it had a microwave, Keurig coffee machine (makes 1 cup at a time, takes a few minutes each time to heat water), an electric fireplace, and two large TVs. The single bathroom had a high-pressure shower and a deep bathtub.I had called ahead to ensure we'd have the cliffehouse with two queen beds and one king; as it turned out, we had one queen and one king bed, but I slept fine on the couch (not a pull out) with the blanket I had brought just in case, but would have liked the 2nd queen, for the price point. Because we had tracked mud in, I called to ask for a bit of housekeeping, and apologized. About 30 minutes later, a young girl showed up and quickly handed me a broom and electric dustbin. Okay, cool, we swept up the entryway mud, and in doing so found a surprising amount of other dirt, so we swept the whole house, which wasn't too clean. Afterwards we tried to go to the pool, but it was closed. It probably wouldn't have been a great experience anyways because it's an unheated chlorine pool that's fully outdoors, and it was in the 60s. That day we asked around for fun places to eat out in the nearby towns, and none of the staff at Cave B really had any clue...a few suggested a restaurant In a town an hour away. There's very little within a 10 mile radius. We ended up driving 20 minutes to Quincy and eating at Idle Hour bar/restaurant. It's not fancy; I'd call it a family/dive bar atmosphere, but the burgers were unexpectedly great and the service was on point. The next day we had breakfast at Tendrils and then hiked the gorge trail down to the river. This is a decent trail but there's no shade (high mountain desert) and the hike leads to an abandoned, shot-up car that I bet is used for bonfires. It's a fine walk, 3 miles roundtrip, but nothing too incredible. We then went to the spa to get massages. This is a very small spa; I had to shower in the men's dressing room because there is only one shower in each small locker room. Unfortunately the massages were poor and my therapist seemed significantly inexperienced, to the point it was awkward. I almost stopped the massage but kept wanting to give them another chance, hoping it might improve. My friends and I then visited the winery. It's a cute little space with an indoor cavern area and a grassy knoll out front that overlooks the gorge. We did an $8 wine tasting and received six pours and a souvenir glass...although I wasn't too fond of the wines, that's a stellar deal, and the gentleman helping us was friendly and well-educated on the wines. We had reservations at Tendrils that night but my friend had been pretty unimpressed with breakfast so we canceled. We had imagined dressing up for a nice dinner with a few courses and some good wine, but the vibe that morning was more low-to-mid-range resort food and indifferent service. Instead we drove 20 minutes to get truly bad pizza in Quincy, so maybe we should have gone with Tendrils, ha! We left the next day with a sense of missed opportunity, feeling kind of crestfallen. It all ended up being nearly $2000 with food, drinks, lodging, spa treatments, but it felt ramshackle and low-quality and there just wasn't much to do. I wanted to tell someone, but the front desk staff had only been working there two weeks so it seemed cruel to ruin someone's day by complaining about things they probably can't change. I figured it might be more useful to warn prospective guests so others don't have the same experience. Anyways, long story short, I'd give it a miss if you're looking for a resort winery trip. If you're passing through the area in the early fall during the harvest, maybe hit up the winery for a few hours and watch the sunset and do a tasting, but I wouldn't stay the night. It's Christmastime 2018 and my wife and I agreed not to make this year a big deal of sharing presents, my wife however rewarded my hard year of work with a stay at Cave B Inn in Quincy, WA for a one hour massage, some wine, some dinner and a very quiet evening in the high desert of Washington only an hour and a half from our home. Let me tell you, late December after some snowfall on a somewhat clear yet chilly day overlooking the Columbia River I was transfixed. The beauty of silence of this place is breathtaking. The outrageous architecture of the facility is modern, stylish and blends into the high desert theme beautifully. The sense of peace and quiet I experienced at the spa was super, and the service was impeccable I have to warn you, this is a place to get centered, not a place for entertainment. If you dig looking out on an open landscape with snow, desert brush, a slow moving river at 2500 feet you will love this place. The rooms are lovely, as are the beds, Fireplace and Bathrooms. The rooms however make no provision for cooking-warming or storing meals, you have the restaurant nearby for that, but no market of any kind nearby. This might be my only negative but I completely understand the esthetic of not having these conveniences. The onsite restaurant is nice, the food more than acceptable and the service when we visited was exceptional. One important note, I'd suggest this location for springtime, autumn or early winter, not when it's hot during summer. The facility closes down just prior to Christmas until March, so book intelligently and carefully and you will be handsomely rewarded. If you must, bring a good book and a CD/Music player. If you want to snack in your room bring snacks, if you want to relax and find your Chi... bring a mat, a warm blanket and some incense, CaveB will provide everything else with delicate care and respect. I've been waiting to check this place out as the high season prices are beyond what I would usually pay when I am "checking a place out." I finally had a low season opportunity to stay at Cave B, and I found out, it's probably worth the high season prices!!! What an excellent place. It was no surprise that my wife and I were blown away by the beautiful setting and views of the Columbia River Gorge. Sunset from the eastern rim of the gorge is always amazing. However, what I didn't expect was how beautifully the lodge and rooms are incorporated into the landscape and how all the vineyards are right there lining the pathways to the rooms, spa, tasting room, and elsewhere. We felt like Greek gods sipping wine and picking grapes from the vines while we sauntered around the property. It was as though we owned the place, I think there may have been one other couple staying there that night, a random Tuesday in October. But I would imagine even when fully booked there is plenty of space for everyone at this relatively small inn. On arrival, we dropped our bags, got a glass and wine, and wandered around the property in awe while the sun set. We encountered benches in strategically beautiful places to sit and relax between sips. We were envious of those with the nicer rooms facing west who could watch the skyline show from their beds and/or balconies. It's a wonder there aren't more gorge-side lodges like this one, but for now, this is a must see. The lobby with it's large fireplace, coffee, tea, and cookies along with games and even remote control cars for rent was cozy and comfortable. There is a nice, but small outdoor seating area overlooking the terraced vines leading down into the gorge. It makes for a great place for an afternoon drink (water or otherwise) and a nice spot to watch the sunset. The pool also is placed in a great spot, cliff-side and while it was too cold to enjoy while we were there, it would be fantastic during a hot eastern Washington summer day. It's situated at the trail-head into the gorge and I can imagine a hot trek up from the river with a very welcome cool down jump in the pool. This is my motivation to come back with the kids during warmer weather. Our room was in the main lodge (one of only several I think). It was pretty unique to have our own entrance up the stairs from the parking lot with a large balcony overlooking parts of the property and northern views of the gorge). I believe it was called the sunrise room, and for good reason, the sun BLAZED in the window in the morning, which in October was OK as it wasn't too early, but some might find it a problem in July when sunrise is closer to 4am. The room was very large with several nice sitting chairs, a love seat, "fake" electric fireplace, and very comfortable bed. Also a nice well appointed bathroom with 2 shower heads that my wife and I enjoyed. I am pretty sure this is their most economical room choice and it's great for the one night we were spending at Cave B on a budget, but the cave room and others I am sure are really spectacular with amazing western views of the gorge, sunset, and no concern about sunrise light. My only complaint was that the adjacent room could also access the balcony and walk past our windows and make noise coming up the stairs. It's not a problem, really, when it's not busy and quiet, but I could see how it would become a potential problem during busier times. I think this suite is mostly used for weddings or similar occasions as a staging area. If not, it should be, it would be perfect for such an occasion. I'll talk about the restaurant in a different post, but suffice it to say, the restaurant (Tendrils) is very nice. There's a large outdoor, pergola covered deck on which I can imagine spending hours eating and drinking on a beautiful summer evening. The service was top notch, food was outstanding, and the wine, as you can imagine, is excellent. While the lodge is really great and the vineyards interesting, the icing on the cake are the trails into the gorge directly from the property along with the immediate access to the gorge amphitheater. My wife and I spent a few hours walking the trails. We followed an absolutely beautiful loop route past small waterfalls, blooming flowers, and interesting rock formations that ended on the banks of the Columbia River. While the water is generally pretty cool year round, it would be very refreshing to wade in on a hot summer day. The "beach" is very rocky and you would appreciate water shoes if you were to head into the river. In the end, Cave B should be on a must visit list especially for a couple who isn't scared to spend a bit more money for a unique and "goreous" experience. I have spent years dreaming of spending a few nights at Cave B hanging by the pool, sipping wine, going to a concert at the amphitheater and enjoying the river on a hot afternoon. Now that I've been there I know I am going to have to go back to make that dream a reality. My husband surprised me with a Sunday night stay in Cavern room . It was our anniversary. Positives: the view , of course. The amenities ( shampoos, soaps, etc) smell divine. I would have loved to purchase some. The bed was comfy. We appreciated the fireplace and extra blanket. The little metal bowl with Q-tips and makeup remover was cute. Cons: Two bath towels is a little lean. I think 3 or 4 would be nice considering the large bath tub. I hate to pick on housekeepers because they have a difficult job, but this place needs work. Before we got in the room I noticed spider webs all around the exterior of our room door. It would take just a few seconds to wipe those away .The first thing you notice coming into the room is the view. Then you notice the filthy windows. A previous guest most have thrown something at the window glass because there were splotches in several places ( photo). The vents need cleaned ( photo) and some of the furniture needs replaced ( photo). The doors were filthy with handprints, especially the bathroom doors ( photo) .By far the worst issue with our room wasn’t discovered until we used the shower the next morning. The mildew in the grout and corners in the wall joints is really substantial, especially when in the shower and looking out ( photo). You need better cleaning staff. We have stayed at other hotels in this price point and have never had these kinds of basic housekeeping issues. I found the note to return the mini flashlights to be in poor taste especially as there are no typical room souvenirs like soap or shampoo. Despite the deficiencies of the room, we did enjoy our stay. With some tweaks to the housekeeping staff, it would be a really nice ‘ experience’ stay. Crack the whip a little and you’ll have a lovely little escape paradise. Three friends and I stayed in a Cliff House room. Our first impression was "wow, this is great" but the room needs some common sense additions. The room has one bedroom with 2 Queen beds, and one King bed in the open, separated by a duel fireplace. The only mirrors in the room are in the bath... not very practical for a room that sleeps up to 6. The coffee maker and fridge are in a cabinet that has no lighting, the closest lamp put off very little light. The Microwave was on a table but no outlet in sight. We had to put it on the floor to use it, unplugging the fridge. Also, please add a couple of blanket/throws. The bath had a nice deep soaking tub but no bath salts to use. With as much as these rooms cost, these additions simply make sense. The "resort" is advertised as 5-star, put some effort into making it that way. With that being said, the view was spectacular. Beds, pillows, linens, all top notch. We had dinner at Tendrils, excellent. Everything that came out of the kitchen looked fantastic. Our steaks were done to perfection, gnocchi was also very good. Over-sized starter salads. Our server, Carl, was great. We had to wait a long time for our desserts - the lava cake kept exploding prior to being served. I had a massage at the spa earlier in the day. Expensive but very nice, Ladies changing room could use a little work - small area gave no privacy for changing but there was a nice shower and toiletries for use. The wine tasting room was VERY busy on a Saturday afternoon. Seems to be a popular destination. Fun staff. I don't drink but my companions were impressed with the tasting (and you get to keep the glass!). Grounds are lovely, but be prepared for walking up and down hills. Pool is set down a VERY steep hill - it wasn't open but it looked inviting - again great views from the pool deck. Overall, it was a lovely special occasion place to stay. I won't rush back but can recommend. I chose cave b as a special treat for my sweetie. The setting and architecture, magnificent. The price a stretch for me but I assumed that for that everything would be elegant and we treated well. I did not feel the management had service as a priority. From untrained staff, Alec at the front desk a stellar exception, to horrible cleaning service, the spraying of awful cleaning products in leiu of getting the socks from under the bed, the mold from the shower,taking out the trash or replacing the coffee service. No one is overseeing the operation, or they just don't care. The rooms at first glance look nice but there is no place to put your clothes, hang a towel or really sit comefortably and talk. Again, management not looking in the rooms or concerned for guests comfort. We went out for wine tasting at the winery and we're insulted by the staff there, who knew nothing of the wine and would not even explain the pours available. Stating "you'll get whatever we pour you" we planned on happily buying a bottle or two but left to avoid further insult. I chalked it all up to being the end of the season and facility and staff tired, but exspected much more. I recommended a visit to the grounds, but not waste your money on accomodations or wine. The only reason I gave this place 2 stars was because the dining room staff was wonderful. We checked in on a Friday afternoon for a single night stay in a 2-room suite. The view was lovely but the suite looked "tired" with windows that had not been washed in quite a while, cobwebs on the patio and a pair of aging chaise lounges without cushions. The only closet was in the front hall and it had a total of 3 hangers and there was just one luggage stand in the master and nothing in the second bedroom. We discovered after checking in that our room was next door to a bride who was due to get married the following afternoon and her suite became party central and so we spent our entire visit surrounded by her guests including late into the evening when we finally had to call the front desk to ask that the party go inside so we could get some sleep. However, the worst part was when I left for brief walk while my 87-year-old mother was showering before dinner and she came out of the bathroom (fortunately fully dress) to discover two men wandering around our suite. She yelled at them to get out and without apologizing they told her SHE should keep her patio door locked because they thought this suite was part of their group. Obviously, I was never informed a wedding was going on around us, and the bride was not informed that there were other guests in her area. The following morning I politely complained to the general manager and told her about the two men in our room and how frightening it was for my mother. Her response was not to apologize but to say this, "We are not responsible for the conduct of our guests." I was shocked how unprofessional and poorly trained she appeared to be. I did not ask for refund (which I believe she should have offered) but instead requested a gift certificate for another stay on a quieter day. She did want to do anything at all initially but eventually offered 50% off a future night. However, after my encounter with her, I would never return. Cave B Inn should be a great place to stay and could be if it was professionally operated and managed. For now, I would not recommend this place to anybody. I probably should have spent more time reading other reviews before making the reservation because it sounds like many other guests have had similar experiences to mine. We wanted a brief getaway from the Puget Sound to do some planning and get some rest and relaxation in before the holiday crush starts. We spent two days and nights at Cave B Inn and Spa in mid-October. We lucked out on the weather with sunny days in the upper 60's and clear nights in the mid 40's. We had a great view of the Orion Meteor Shower the first night. But back to the Inn and Staff. We stayed in Cliff House No. 7 which is the closed of these dwelling to the main lodge where reception and Tendrils Restaurant are located. A nicely laid out stand alone suite with a very comfortable bed, "living room", entry, bathroom and patio with an amazing view of the Columbia Gorge and River. Very quite and peaceful. These unit are nestled in the rows of wine grapes that surround the Lodge. The Satellite TV displays on a large flat screen in the living area and a smaller one in the bedroom. there is a see through fireplace that divides the two main rooms. We had only one concern.... bugs. There are a lot of flys and gnats in the late afternoon and evening that are drawn to the fallen grapes and more than a few got into the room.... Slap! One down. Suggesting is to bring a citronella candle for the deck and maybe a swatter. This was a very minor annoyance. The drain in the bathroom sink was slow to clear, again a minor annoyance. We have two dinners at Tendrils on the Caveman Special package. The first is was a 5 course meal including a generous and tasty plate of antipasti, a roasted beet salad, a cup of vegetable minestrone soup, each paired with a great wine from the next door Cave B winery. The main course was a "spider" steak with mashed potatoes and fresh late season broccolini and carrots. Dessert was a raspberry sorbet. The main dish was paired the winery's 2015 30 year vine Cab. It is spectacular for a 3 year wine. Meal for two ran around $200 sans tip as was covered in the Caveman special. So was dinner the next night. Kudos to Gerry, Eric and Gabby for great service in the dinning room. At check-in we received two bottle of their Caveman red, also very nice. We found the grounds very pleasant to walk around and the Winery's tasting room is a short walk from the Lodge. I took a quick late afternoon dip in their outdoor pool. Clean, great views and only a little on the cool side given the time of year. All in all we had a great time. My wife and I were in a bit of a bind and needed a place to stay. We already had reservations at Tendril and we figured that we would check to see if Cave B had any rooms open. The lady at the front desk said that they did have a yurt available at $433 for the night. Not really having an option, and thinking my wife and I deserved a little luxury splurge, I agreed to it. We opened the door to to the yurt and were less than impressed. A rather large ant ran across the floor in front of me, but no big deal, it is nature and ants will find their way in. I quickly got rid of the ant. There was a black blanket on the end of the bed and when my wife lifted it up, there was a lot of dirt underneath, as well as a long hair and what I believed was a wolf spider (after google reverse picture search) and some other unrecognizable bug. I quickly captured both in a glass. According to the check in sheet, it says that we are in nature and if we encounter any wildlife we should contact front desk and a wildlife expert will come to remove the issue. We call the front desk and the a little while later the front desk lady came to the yurt. She didn't want to go near the cup as she said she was afraid of spiders. She told me that all she could offer me was a bottle of wine, and she would get me a business card of the general manager, so I could email her, and left. She left both the nasty blanket and the bugs in our room and we had to put them outside on the porch ourselves. We waited a bit for her to return with the card and bottle of wine and she never did, so we walked down to the restaurant to get our dinner. I went to the restroom shortly after being seated and walked up the the front desk to ask if the lady left the business card in the yurt, and she seemed confused, so I started to explaining that she said that she was going to bring me a business card so I can email the general manager, and she said "Oh. yeah" and gave me the card. We were seated immediately, and waited for our server. He was very nice and professional when he came to us, but it took him nearly 20 minutes to make contact with us from when we were first seated. In that time I found an empty water bottle in the bushes that were touching my chair. I could tell he was swamped and working hard, but he still did everything he could to give us proper service. My wife ordered a cocktail and I a glass of wine. We had to send the cocktail back as it was way overly sour and not drinkable. Our waiter apologized and offered to correct it. We opted just to have it taken off the bill and drink wine. For appetizers, my wife ordered the baby beet salad, which was delicious, although a little heavily dressed, and I ordered the frito misto. The frito misto was a bland, extrememly soggy and greasy mess on a plate, even the dipping sauce didn't add much flavor. I only ate maybe 1/3 of the plate. My wife ordered the gnochii, for her entree and was very disappointed in the sauce that it was served with. It once again was very bland and not exciting, you can buy a better sauce in a jar at the grocery store. I ordered the spider steak with blue cheese sauce. The steak itself was okay even if slightly over cooked, but the mashed potatoes were very lumpy, and the vegetables were extremely over cooked. We took the rest of the bottle of wine and headed back to our yurt. My wife went and showered, and when she came out, she told me how almost painful the shower was. When I showered, I got the same effect. It is like the shower head needed to be de-limed or something. The water came out like pins and needles and was not relaxing in the least. Over all, for the price that we paid for that yurt the luxury level should have been higher. Most places for those prices would include a complimentary wine tasting or bottle of wine in your room, a dining or spa credit or something. But nothing at Cave B. We are highly disappointed and feel that we were taken advantage of and regret that we stayed at a place that has been on our list for a while. I had email correspondence with the general manager who agreed with the validity of my gripes but offered very little to make up for the fact that we spent so much money and had such an incredibly disappointing stay. Third time to Cave B and love it more every time! Stayed in Cliffehouse #5. Highly recommend the Cliffehouse - fabulous view, private, secluded balcony to watch the sunset, clean and luxurious inside. Tasted at the Cave B winery. Enjoyed a fantastic couples massage with Eve and Megan after a hike to the river and lunch at Tendrils. Took the advice of another reviewer and skipped dinner at the restaurant and instead brought our own wine and picnic snacks for the balcony. This is a Must-Do for a romantic get-away in this area! Cave B Inn places you within a short walk of Cave B Estate Winery and within a mile (2 km) of The Gorge Amphitheatre. This 4-star hotel has 30 rooms and welcomes guests with a restaurant, free in-room WiFi, and free valet parking. In addition to a meal at the onsite restaurant, you can also enjoy a drink at the bar/lounge. Savor a meal from the privacy of your room with room service, or get a pick-me-up at the coffee shop/café. Guests can expect to find free WiFi and a TV with a DVD player. Beds sport premium bedding and the bathroom offers a hair dryer and designer toiletries. Other standard amenities include a balcony, a sitting area, and a coffee maker. Cave B Inn features free WiFi in public areas, conference space, and spa treatment rooms. You can take advantage of free valet parking, along with an airport shuttle for a fee. The 24-hour front desk has multilingual staff ready to help secure valuables, and answer any questions about the area. Other amenities at this boutique hotel include a library, express check-in, and express check-out. The preferred airport is Wenatchee, WA (EAT-Pangborn Memorial): 56-min drive, 43.6 mi/70.2 km. The front desk is open 24 hours a day, and checking in and out are easy with express services. For convenient arrivals and departures, you can take advantage of the airport shuttle (fees apply). Driving? This property offers free valet parking.